In the summer of 1921 Gehrig had a couple of things going for him. He was a high school graduate (a rare accomplishment at the time for someone of his social background), and he was being recruited by 24 universities for his athletic aptitude. Mom Gehrig made it very simple for her son to chose Columbia University - she had been working in Columbia's Phi Delta Theta fraternity house as cook/housekeeper since Gehrig's high school beginnings, and Pop was the occasional handyman there. Gehrig was teased relentlessly by the frat boys so he wasn't exactly thrilled about the prospect of attending Columbia, but, being the ultimate mamma's boy, Gehrig signed with Columbia to play both football and baseball for the Lions. Gehrig just wanted to play ball; Mom wanted him to be an engineer like his uncle in Germany. In reality Gehrig knew he was better at games than academics, but later in life he would tell his wife that he dreamed of surveying and building in the West. The first lesson he ever learned was perseverance, and he strived hard to overcome his scholastic shortcomings, attending intense summer school to be able to pass Columbia's strenuous entrance exams. And then he made a boo-boo. Back on April 5, 1921, a semi-pro team manager, Art Irwin, saw Gehrig play a Commerce High-Columbia exhibition game at South Field (the university's home turf). Impressed thoroughly with the 17-year-old's monster homeruns, Irwin arranged a tryout with Giants scout Art Devlin. Devlin, too, was impressed and took Gehrig to see the wretch-of-a-man John McGraw, Giants manager. Known for his short fuse, McGraw refused to so much as glance at Gehrig's full range of talents, harshly shooing the kid away. While Devlin and Irwin eased into thinking of a Plan B, Gehrig began to horde ill feelings toward McGraw, feelings that would be rekindled throughout his future baseball career. 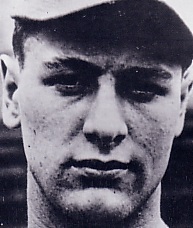 The Plan B that Irwin and Devlin concocted was to send Gehrig to Hartford, Connecticut, where he could play for the Senators, a semi-pro team in the Eastern League. Whether or not Gehrig fully knew that it was against collegiate rules to play semi-pro ball is not exactly clear, but he must have hesitated. Irwin had to make him believe that Columbia would never find out and, even if they did, they wouldn't say anything about it. The more important factor to Gehrig was that he would be getting pay to play ball, pay his family needed. So, on June 2, 1921, Gehrig signed up to play with Hartford. His first game was June 3; he played under the poorly conceived name "Lou Lewis." Within two weeks he had amassed a .261 batting average. On June 8 the Hartford Times slipped up and used his real name. Perhaps this is partly what tipped off Columbia's baseball coach Andy Coakley as to the true identity of "Lewis." Coakley went to Hartford straight away to collect the youngster. Contrary to the promises Devlin and Irwin made, Columbia University did find out and did have something to say about it: Gehrig was to be ineligible indefinitely from college ball. At Coakley's persuasion, Columbia agreed to allow Gehrig to be suspended from college baseball for one season if Coakley wrote to all of Columbia's competitors, explained the situation, and asked for their permission to allow Gehrig to play after a temporary suspension. All the other universities kindly conceded that a one-year suspension was plenty punishment. Not able to go long without playing baseball, Gehrig played in Morristown, New Jersey, on Sundays for a baseball club during the summers of 1922 and 1923 under another conspicuous name, "Lou Long." He earned experience and money for his efforts. His escapades were common knowledge, but for whatever reason, the athletic department at Columbia turned a blind eye and a deaf ear. In matters of student life Gehrig suffered. He rushed Phi Delta Theta and became a figurative brother. But it was obvious to everyone, including Gehrig, that he did not belong in that crowd. If boys were tough to get along with, girls were even tougher. Poor Gehrig was rumored to have not dated at all during his college years. The kids Gehrig was in the midst of at Columbia were more than one social class above him, and because he still looked like the disheveled kid from Yorkville, seldom did anyone associate with him if it didn't involve some sort of sport. Quickly he grew a distaste for Columbia, to him the emblem of rich and snobbery. He did enjoy his American history class with Professor Robert L. Schuyler. Classmate Vernon B. Hampton recalled how he would not do the required reading and feared Schuyler calling on him to answer questions. "But Lou always knew the answer," Hampton said. Gehrig was not the best of students, but he worked as hard at the books as he did on the field. Consequently he shone in classes where he was respected as a hard worker (such as in Schulyer's class) and not as a good-fortuned peasant. A little-known story about Gehrig in his college days is the time he was with Professor John Erskine's class studying one of the gigantic assemblages of prehistoric beasts in Schermerhorn Hall. Hampton recalled that Gehrig was spotted jovially trying to slide down a beast's neck in the middle of class. Sidelining the little comfort Gehrig found in class and society, he found a much larger comfort as a fighting Lion. His only season of Lions ball was 1922/1923, his sophomore year. Football was a decent try. Gehrig, always the versatile player if it meant betterment for the team, played halfback and tackle. Buck O'Neil was the Lions football coach, and he wanted Gehrig to concentrate on the line because of his intimidating physical presence. But Gehrig loved to run and insisted that he be given room to use all of his abilities, not just his strength. As a result, Gehrig played halfback and tackle (his yearbook listed him as "Tackle" and "Guard"). Teamed with all-American running back Wally Kippisch, the Lions had a formidable team. The press and his teammates spoke well when they spoke of Gehrig. One teammate said of Gehrig, "They stomped all over Lou, but they could never crush his grin or spirit." Robert Pulleyn, a teammate, said, "He was a battler. On the football field Lou worked with everything he had." Columbia's Alumni News reporter Paul Gallico (who would later write the first Gehrig biography, Pride of the Yankees, the companion book to the movie) wrote, "Gehrig is the beef expert who has mastered the science of going where he is sent, for at least five yards. His plunges seemed to carry force." Baseball was more productive. Gehrig played 10 games at first base, 11 as pitcher, and 3 as a combination of both. Five out of his 11 pitching turns were games in which he struck out ten or more opponents. He set a school record of 17 strikeouts (stood until 1968) against Williams on April 18, the same day Yankee Stadium opened. In that single season, Gehrig hit a school-record 7 homeruns, most over 400 feet long and some are legends still told on campus. April 21, 1923, Ithaca, New York, against Cornell. Gehrig lifted one over the tall right field fence into the forest beyond. Cornell generations afterwards have never seen a longer homerun. April 26, 1923, South Field, Columbia, against Rutgers. Gehrig sent two homers into the tall, tall trees lining the field. Paul Krichell, one of the most respected and successful scouts in his time, watched Gehrig on behalf of the Yankees. He was astounded and practically stumbled over his own feet running back to general manager Ed Barrow's office. "I think I've just seen another Babe Ruth," he gasped. Barrow, similar to McGraw back in 1921, didn't buy it and told Krichell to double check. The next game was against cross-town rival NYU* on April 28. Krichell cleared his calendar. Meanwhile, the Washington Senators, similar to McGraw, made a costly mistake in scouting Gehrig, or, better said, the lack of scouting Gehrig. Coakley had told the Senators first baseman Joe Judge about his young prize. Judge in turn told Clark Griffith, the Senators owner, but Griffith's scout never showed up to South Field. A costly mistake because Gehrig was about to prove his worth and establish yet another homerun legend. With Krichell watching like a giddy boy at the circus, Gehrig went to the plate in the 9th inning with a tie 2-2 score and slammed the pitch served up by NYU's hurler. The ball soared over the bordering 116th Street and bounced off the steps of the library on the other side, nearly blindsiding the Columbia's dean. According to legend, this is the second-longest homerun ever hit out of South Field, the longest being Gehrig's rounder on May 19 against Wesleyan that touched down on the steps of the Journalism School over 450 feet away from home. Confident that he did find "another Babe Ruth," Krichell approached Gehrig after the game. "I'm talking business to you right now," Krichell said. "Would you like to play with the Yankees?" Gehrig, unaware there were scouts in the crowd that day, stammered, "Are you serious?" Very serious. Gehrig was offered a $1,500 signing bonus and $2,000 to finish out the season. With his parents both racking up major medical bills, Gehrig's first reaction was to sign and leave the school he never felt a part of and the books of knowledge he never really absorbed. But he had enough sense to first seek the third-party advice of his trusted professor Archibald Stockder. "Lou," Stockder said, "you've been in my class for almost a year...I think you better play baseball." Gehrig, along with Coach Coakley, went to Ed Barrow's office a few days after Krichell's proposition, slightly late for his 10:00 appointment, to sign a major league contract. Though Mom Gehrig was little thrilled with his decision to abandon school, she could not think of a single argument against the money. Aside from alleviating his family's debt ulcer, Gehrig held a bit of regret about his quick decision to jump at money. Later he would tell Sporting News, "The financial inducement for me to leave Columbia was tremendous. The money they put before me was enough to turn any kid's head. I was still not sure I wanted to go into baseball as a steady profession, but I decided to grab what I could of it. That's the wrong way to look at baseball and I soon changed my mind." "I have been in the employment of the New York Yankees owned by Colonel Jacob Ruppert since June, 1923. My recreations are almost every form of sport. My hobbies are good books and athletic contests. I married Miss Eleanor Twitchell on September 29, 1933. No children. Sorry that I cannot accomodate [sic] you with a recent picture. The day Gehrig died, he still owed Phi Delta Theta an undisclosed amount of money in fees. *Discrepancy among Gehrig biographies: Robinson and Bak claim this game was against NYU; Graham claims it was against Penn with college-great Walter Huntzinger on the mound.